Vacation is about more than just sun, sea and sand. It is precious time for relaxation and regeneration, which creates a pleasant distance from everyday life. 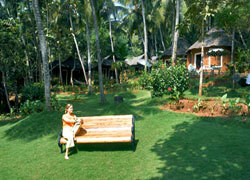 The Somatheeram Ayurvedic Resort in Kerala offers a unique combination of holiday and health. A picturesque setting and an offering which refreshes body, soul and spirit alike turns a stay in Somatheeram into an unforgettable experience. Somatheeram is located on the South Indian Malabar Coast, just 30 minutes from Trivandrum International Airport, in a paradise-like environment known as “God’s own garden” in India due to its scenic beauty. The natural environment, with green coconut trees and blue water, provides the resort with a unique setting. Somatheeram is a leading Ayurveda resort in India, declared “Best Ayurvedic Centre” several times by the Kerala state government for its high standards of professionalism. 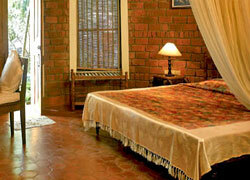 It also acquired the coveted “Green Leaf”, the highest seal of approval for an Ayurveda Centre. People from all over the world seeking rest and relaxation find a combination of health resort, Ayurveda, yoga and meditation here, benefitting from more than 20 years of experience. The spacious complex is located on a hill surrounded by tropical gardens with rich vegetation. The typical Kerala-style wooden houses, stone bungalows and cottages with palm leaf roofs offer 50 spacious accommodations, all with attached bath and furnishings of a European standard. The bungalows are built in traditional Kerala style, with antique carved door frames and wooden pillars, and present the style elements of Kerala architecture in a unique way. The rooms are spread out spaciously over the sloping terrain, which is planted with coconut trees, exotic plants and Ayurvedic herbs. Buildings and nature are carefully intertwined to form a harmonious unit together with the resort’s exclusive, pristine beach, 1 to 5 minutes away. At the beach, guests are provided with parasols and loungers. A healthy life also means proper nourishment. The Somatheeram restaurant specializes in varied, balanced and tasty meals and it serves Indian, European and Ayurvedic cuisine. It also serves as a meeting place for cultural events. The highlight of the resort is the prestigious and world-renowned Somatheeram Ayurveda center, often designated as the highest ranking Ayurvedic clinic. It is managed by highly qualified and experienced Ayurvedic doctors who, together with a team of more than 70 employees, help the guests achieve relaxation and regeneration through exquisite treatments and massages. All doctors and employees come from traditional Ayurvedic families. Each guest receives personalized treatment and care. Man is viewed as a oneness, a unity of body, soul and spirit, and each treatment plan is tailored accordingly to the individual needs of the patient. At the start of a cure, there is an initial examination by the attending doctors which, apart from looking at the medical history and lifestyle habits, includes the pulse diagnosis and physical examination. An important role is played here by the determined Dosha type according to the Ayurvedic TriDosha concept. The aim of an Ayurvedic treatment is to restore balance. Basic components of the treatment are oil massages and various herbal and cleansing treatments. In accordance with Ayurvedic teachings, yoga and meditation are part of the daily program as well. The exercises will, under the guidance of experienced yoga teachers, help to relieve mental stress and find inner peace. In addition, yoga can be therapeutic, both in a curative and a preventative sense. A stay in Somatheeram not only allows for an intense and relaxing Ayurvedic program, it also provides insights into the South Indian surroundings, which are rich in tradition, culture and scenic beauty. Various excursions offer an opportunity to explore nearby places of interest and occasions to get to know the country and its people. Recommended destinations for trips include the backwaters, the Veli Tourist Village, the Padmanabhapuram Palace and Kanyakumari.